The last time we were in San Diego, we stayed at Santee Lakes Recreation Preserve, about 40 minutes outside of the city. While we enjoyed the park, driving into the city to do sightseeing became tedious quickly. This year we decided to stay inside San Diego at the Mission Bay RV Resort. 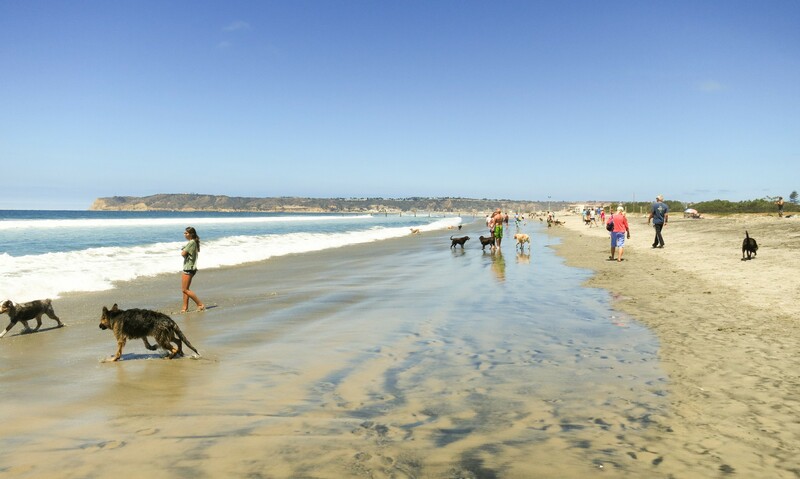 It’s located right next to Mission Bay, the largest man-made aquatic park in the country, and our daily dog walks took us right along the beach. Opie loved being camped right next to the beach. 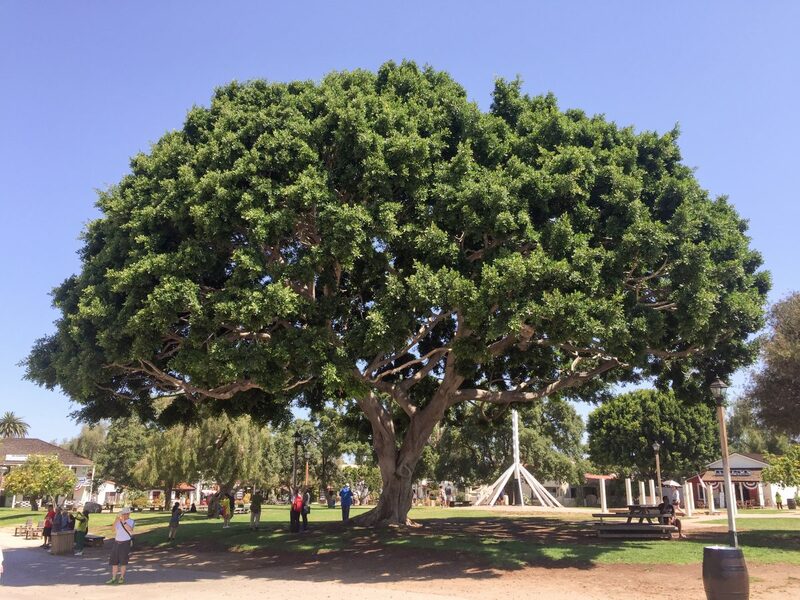 While the RV resort is basically a huge paved parking lot and we expected it to be tight, there was enough camping space to be comfortable, and there were a surprising number of trees which softened the “parking lot” feel. The area is hopping busy on the weekends with vacationers and weekenders. Jet skis, speedboats, and waterskis pack the Bay while the parking lots overflow with RVs. It’s fun to observe the activity but it does get old quick when the weekenders insist on cutting through your campsite regularly. Opie was ecstatic (as were we) by the fact that not only were we right on the bay, but we were close to THREE dog beaches. I’m quite sure not only did he stay damp the entire time we were there, but he also brought three pounds of beach sand into Rover! Impressively, at all the dog-friendly spots we noticed the dogs (and owners) were quite well-behaved. The dogs would play, chase, and wrestle, but no fights broke out. There was almost no poop on the ground–everyone we saw picked up after their dogs. The atmosphere was casual and friendly. It’s a marked difference from the dog park in Virginia. Perhaps there is something to the stereotype that Californians tends to be more laid-back and relaxed and it trickles down to their pets. 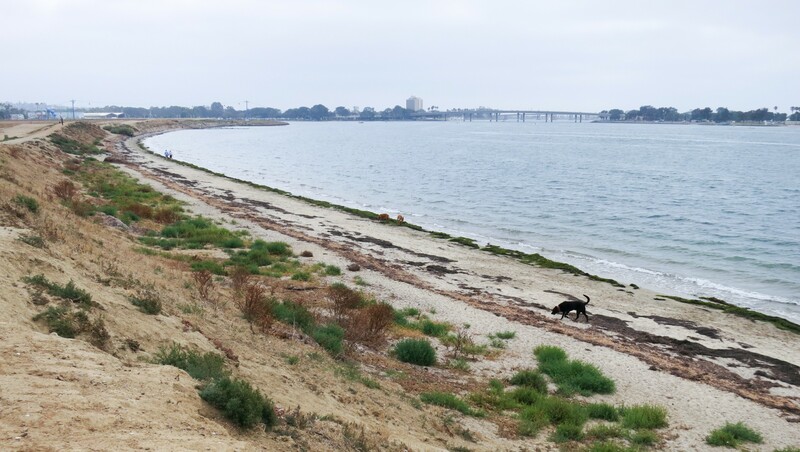 Fiesta Island allows off-leash dogs on the entire island. 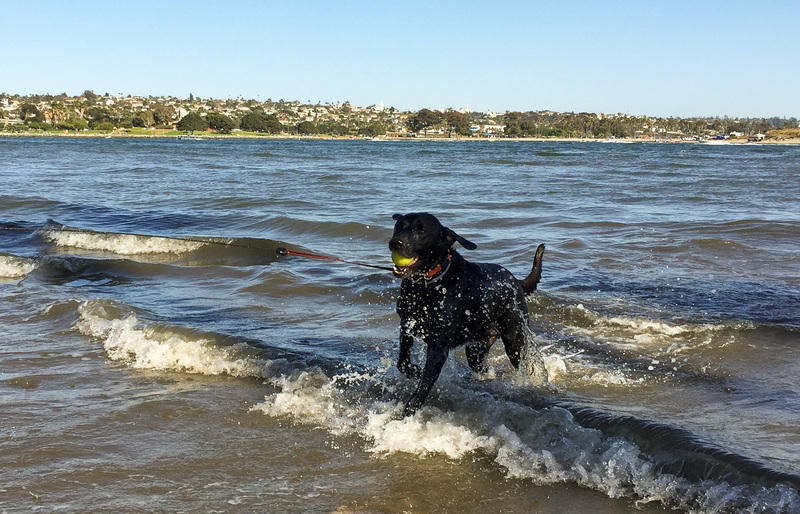 There is a large fenced-in area with access to the bay and large flat field to run around but anywhere on the island, and you are allowed to let your dog roam off-leash (under voice control). One side of the island faces Mission Bay so the waves are rough (especially with all the recreational vehicles) and there’s a lot of sea vegetation on the beach but that’s where most of the dogs romped. The other side of the island faces two isolated coves where the water is much calmer and tend to be more deserted. While Opie liked romping with the dogs, he enjoyed wallowing in the calm cove water when he wanted to cool off. Of the three dog areas, it was always the least crowded. We also visited Ocean Beach, nationally famous as one of the first official leash-free beaches in the US. It’s about a mile long with areas of rough waves (we saw surfers enjoying the water here) which curves around into a calmer channel with a strong current but no waves. It was the most crowded, and parking is sparse if you arrive after 11am in the summer. 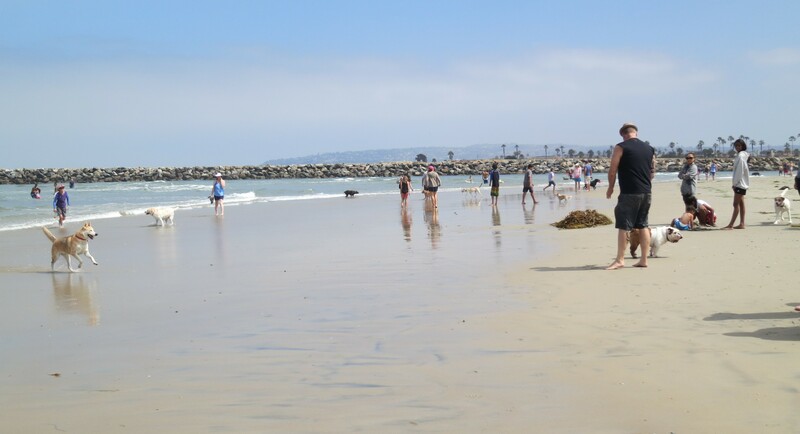 Lastly we visited Coronado Dog Beach, located right next to the North Island Naval Base. The waves were not too rough, and while the beach is smaller than Ocean Beach it’s still very popular (parking is a challenge in the summer afternoons). While Opie enjoyed playing with the dogs, fetching his ball, and wallowing in the water, we enjoyed watching old military planes fly around the Naval Base. The beach only has on street parking and you need to walk along a sand path to get to the beach. A word of warning though, the sand path to the beach gets VERY hot by the afternoon so watch your dog’s paws! At the entrance to the dog path is a water fountain with a hose to wash off the sand when you’re finished, which I thought was a brilliant idea! 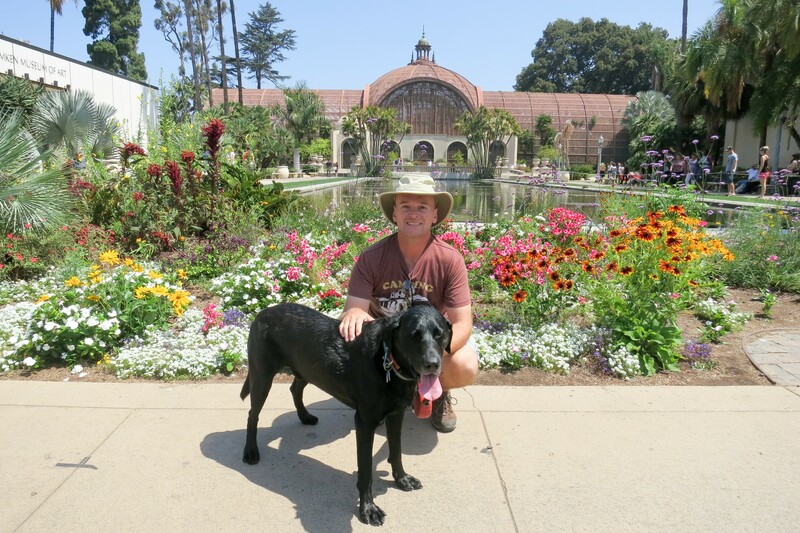 San Diego is known to be dog-friendly and I would whole-heartedly agree. While at Coronado, we decided to eat at Bluewater Boathouse Seafood Grill, a dog-friendly restaurant, so I could quench my seafood craving. We ate on their patio and they had a separate menu for dogs! 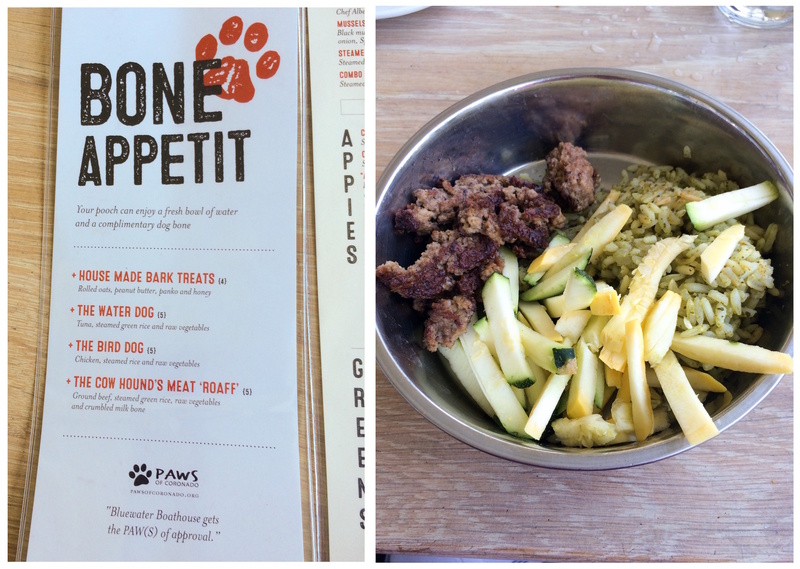 We couldn’t resist and ordered the Meat “Roaff” for Opie. It’s a full meal with ground beef, squash, rice, and crumbled Milk Bone. Opie loved it and licked his bowl clean. I enjoyed my cioppini (yes, it’s a San Francisco dish but it was good even in San Diego) while Mike found his burger to be just OK. We also ate at Shades in Ocean Beach, another dog-friendly restaurant. While they also had a dog menu, it wasn’t quite as fancy. The diced ham meal was just cold lunchmeat ham sliced into small pieces but I don’t think Opie was complaining. Last year in San Diego a friend recommended Hodads, a burger joint. We went to the one in the Gaslight Quarters and loved the burgers and gigantic milkshake. 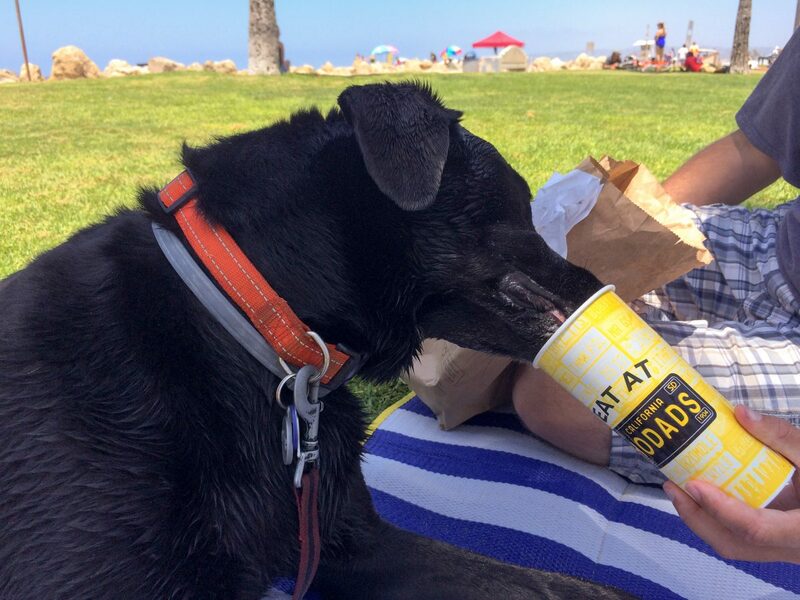 Lucky for us, the original Hodads is located in Ocean Beach so we ended up getting Hodads take-out a couple times. Since it’s not dog-friendly, we found a nice stretch of grassy park overlooking the bay, spread out our blanket, and enjoyed the view while sharing our fries with Opie. We did have an adults-only day out to Old Town San Diego. 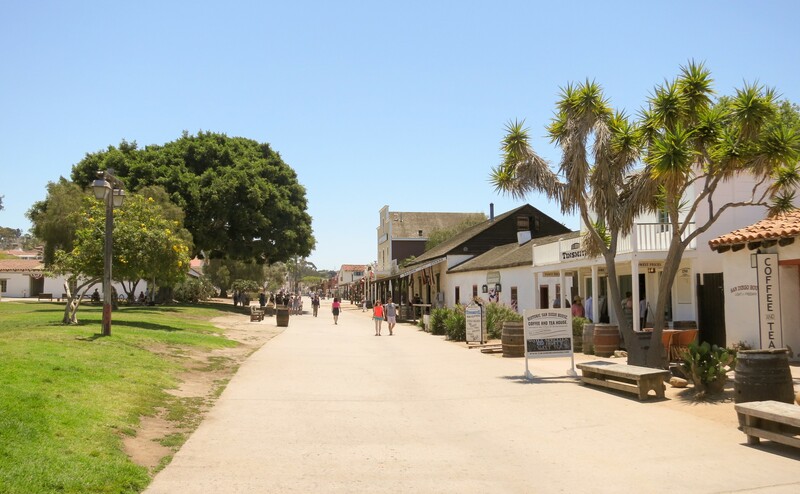 Old Town is an historical park located inside the city and commemorates early San Diego. Frommers has a nice self-guided walking tour of Old Town which was fascinating and educational. I have to admit that I found the San Diego Union Printing office to be the most intriguing of the buildings. It’s a prefab home that was built in Maine, shipped all the way around Cape Horn in multiple pieces, and reassembled in San Diego in 1851. You walk around Old Town and all of a sudden you see a very New England style home right on main street! The visitors center also has free tours twice a day. We also wanted to visit Balboa Park, the nation’s largest urban cultural park. While Balboa Park was created in 1868, it didn’t really begin to take off until San Diego was to host the 1915 Panama-California Exposition, to commemorate the opening of the Panama Canal. 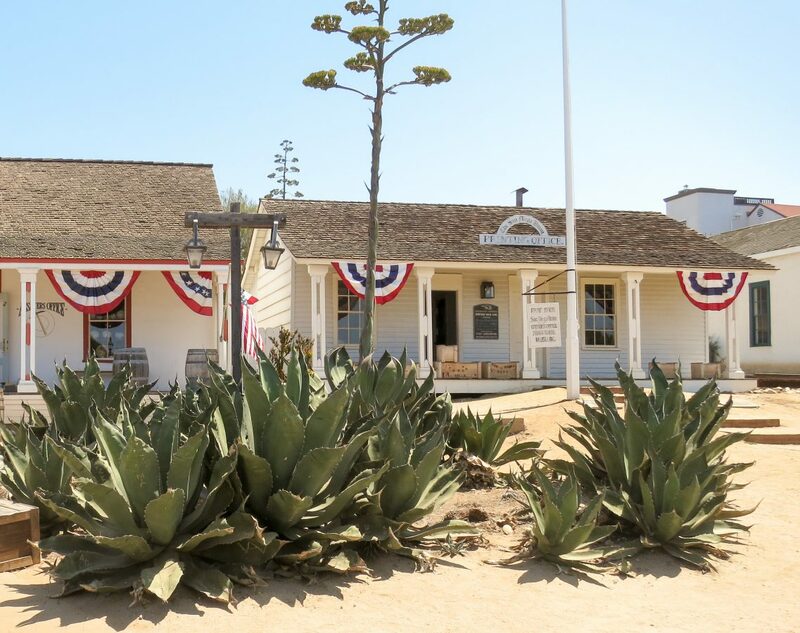 Many of the buildings and museums were created specifically for the exposition, such as the Museum of Man, the Old Globe Theater, the Cabrillo Bridge, and the Spreckels Organ pavilion. 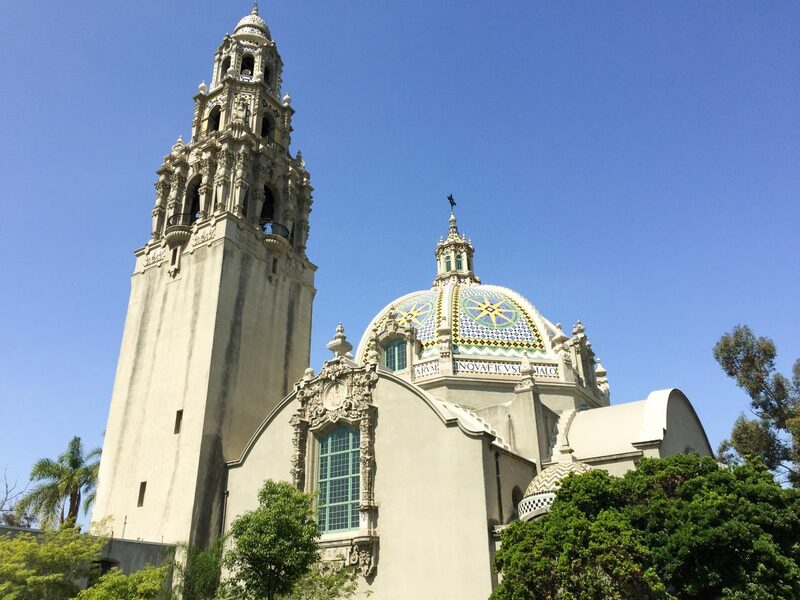 Since then, Balboa Park has continued to grow and now boasts 15 major museums, 16 gardens, the San Diego Zoo, and numerous other venues and buildings. Since we were bringing Opie with us (yes, he really does rule our lives), we didn’t go inside any of the museums, but we did another self-guided walking tour and saw some beautiful architecture and gardens. We visited the Speckels Organ Pavilion, which houses one of the largest outdoor pipe organs. They provide free concerts in the summers and weekends but our timing didn’t work out. While the Japanese Garden doesn’t allow dogs, there’s a nice overlook near the visitors center where you can see parts of the garden. I also spent some time gawking at the San Diego Museum of Man. The exterior has some amazing features and statues. It also looks like something that belongs in historic eras from Spain or Rome. Balboa Park is immense with so many different things to visit. I would love to visit some of the museums (without Opie) the next time we are in San Diego. We enjoyed staying right inside the city, it has a lot of great advantages. We were only here for a week though due to the premium cost. We were so pleased by the location that we decided if we come back to San Diego in the winter, we would stay in Mission Bay for a month due to the cheap off-season rate and convenience of location. Did you really say “Californians tends to be more laid-back and relaxed” !!! Now I think that’s the very first time I have heard anyone say that LOL!!! We have not done San Diego yet and mainly because it’s in California and we find the people to NOT be as you described. Maybe things have changed. But we will brave it some day. Looks like you ae having a great time. LOL, that’s cause you’re from the West Coast. 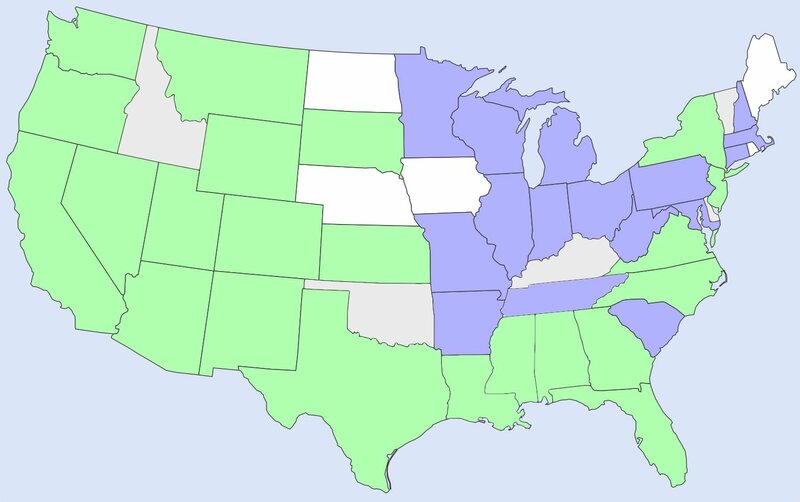 I’m sure there are parts of CA where the folks are not so laid-back, but I’m from the East Coast/DC where things are not so relaxed. Course the driving in San Diego is a WHOLE ‘nuther story, CRAZY drivers!! People seem pretty relaxed in San Diego but I’d say the beautiful weather and all the beach/water probably helps a lot. If you’re ever in the area, definitely give it a shot, there are some beautiful spots to visit in San Diego. We did enjoy it a lot but that’s also due to so many dog-friendly places we could visit. Mission Bay seems to have that special, “location, location, location” factor. Sounds like the perfect place to say if we make it to San Diego. Vicki, it is definitely a great place to stay if you want to explore San Diego. 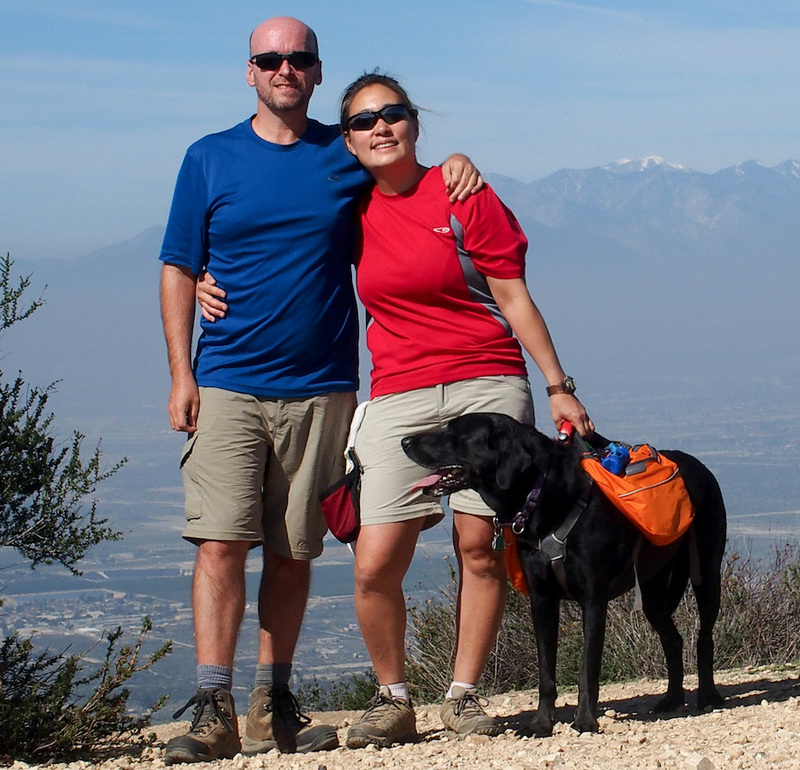 We love Santee Parks as a place to camp but it’s just too far to drive into San Diego often. Mission Bay RV Park is definitely crazy busy on the weekends in the summer though! We look forward to trying the RV park in the winter when it’s not so crowded. I do hope you make it to San Diego, it’s a fun place to visit. I have never heard anyone say a single bad thing about San Diego. It just seems like one of those few universally loved places. I’m sure the weather helps. And the beaches. And the neighborhoods. And the food. And the mentality. And and and…. I can’t wait to go check it out! Glad you guys had fun! True, we’ve never heard a bad thing about San Diego (except the cost of living, everything is expensive there!). It’s a fun place to visit, can’t wait to hear about when you visit and what you think of it. I agree, Mission Bay is great for location, I think we’d lean to staying there in the winter/off-season than during summer though. The price difference is significant (especially for a month stay) and less crowds makes it much more attractive to us. We always loved our visits to San Diego before the RV. There is nothing like beach time. This May we were at Chula Vista and Mission Bay with the RV and agree you can’t beat the location of Mission Bay. It was easy to forget about that parking lot feel of the park when you have so many places from there to escape. We are going to be in Breckenridge the 2nd week of September and planning on going to the Oktoberfest in Vail village on the 16th. 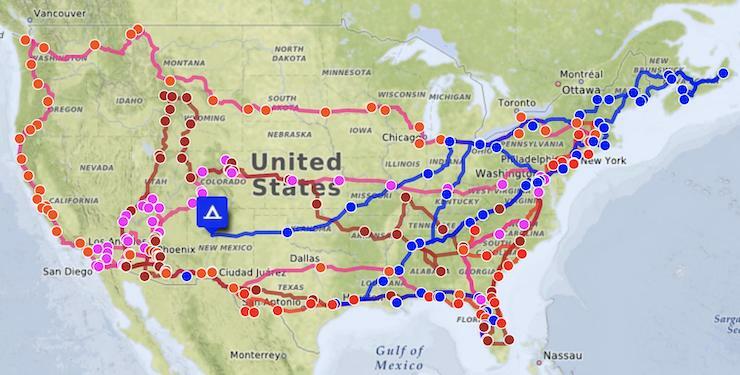 If you both get away for any side trips from Denver to Breckenridge or Vail, let us know. Oh wow, is Sept too early to start getting snow in Breckenridge? Sounds like the views would be spectacular! We really did enjoy San Diego and you’re right, it is easy to forget about how Mission Bay feels due to the amazing location! I will definitely let you know if we head over to Breckenridge or Vail in September.